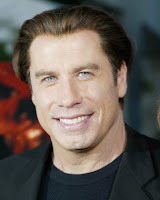 Anyone have any idea why John Travolta might be in the area? According to the Salem News, he was supposedly at the Topsfield Fair this past weekend with his kids. Did he come all the way out here just to go to the fair? Actor John Travolta was at the Topsfield Fair, but he kept a low profile. "We understand that he's here with his children," said Sally O'Maley, the head of public relations for the fair. "But no one has seen him." According to O'Maley, Travolta's visit was a surprise even to her. She, along with many others, first heard about the planned visit yesterday morning when it was announced on the radio. "Kiss 108 had it on this morning," she said. After that, her phone was bombarded with calls from patrons who wanted to know if the rumor was true. Anyone happen to go to the fair and see him? 1 Response to "John Travolta at Topsfield Fair"
He does have a house in Maine on Isleboro, so maybe they came down from there for the day?